As the characteristic theme song from the show played over the loudspeakers, and the lights went down (even though it wasn’t Ryan Seacrest asking Kieran to dim them), I knew the show was about to start. The shimmering, blue spokes radiating out from the center of the American Idol logo moved more and more erratically, counting down the seconds until the finalists were revealed. 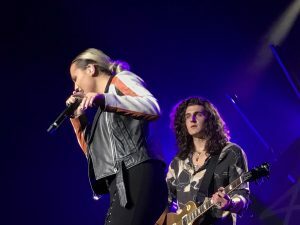 Then the opening chords of Bebe Rexha’s song, “Meant to Be” was heard filling the space of the Zeiterion Theater in New Bedford, MA as the top six of the show appeared when the lights came up. 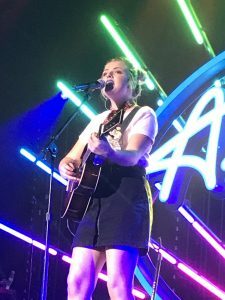 The poppy radio hit blends their voices together beautifully, and I had no doubt that I was in for a fabulous show featuring Catie Turner, Michael J. Woodard, Cade Foehner, Gabby Barrett, Caleb Lee Hutchinson, and Maddie Poppe (Jurnee was supposed to be performing as well, but has allegedly been suffering from health issues and needed to quit the tour, sadly). 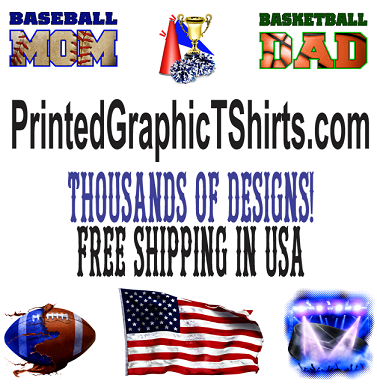 The American Idol Live tour is a sort of spin-off from the acclaimed TV show, formerly on FOX, and now on ABC. 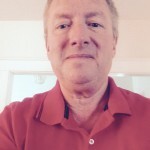 I have been watching the show with my parents just about every year since I can remember (and thinking back, I was about five years old when Kelly Clarkson won the very first season, but I do remember it). This show was a significant part of my childhood, as I fondly remember being plopped in front of the TV laughing at the amazingly terrible acts and the harsh (but accurate) commentary from the ever-opinionated Simon Cowell, as well as dropping my jaw at the fantastic vocalists who were clearly channeling some of the greats. And as I got older, I started to fangirl over some of the more handsome faces of the show, the most significant so far being Dalton Rapattoni, third-place finalist of season fifteen who I managed to see live and meet three times (and the last season on FOX before the near-apocalyptic shift of the show over to ABC). Regardless of how many times I had watched the show with my parents, I had never gone to the official American Idol LIVE tour put on by the show, and when I found myself getting very attached to this year’s finalists, and heard that the show was coming to New Bedford (conveniently located just about thirty minutes away from home), I knew I just had to see them live, and the show did not disappoint. 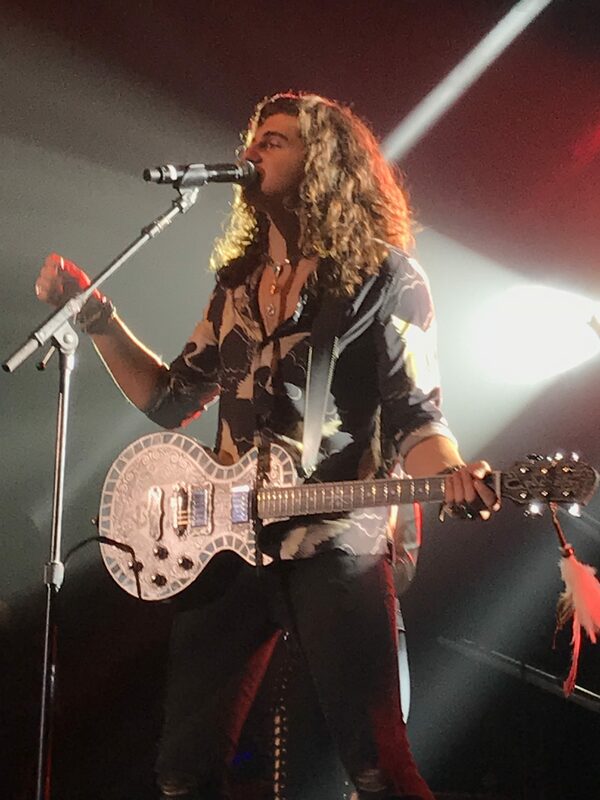 Even after sufficiently fangirling over top four finalist rocker Cade Foehner, I truly enjoyed seeing the rest of the finalists as well. 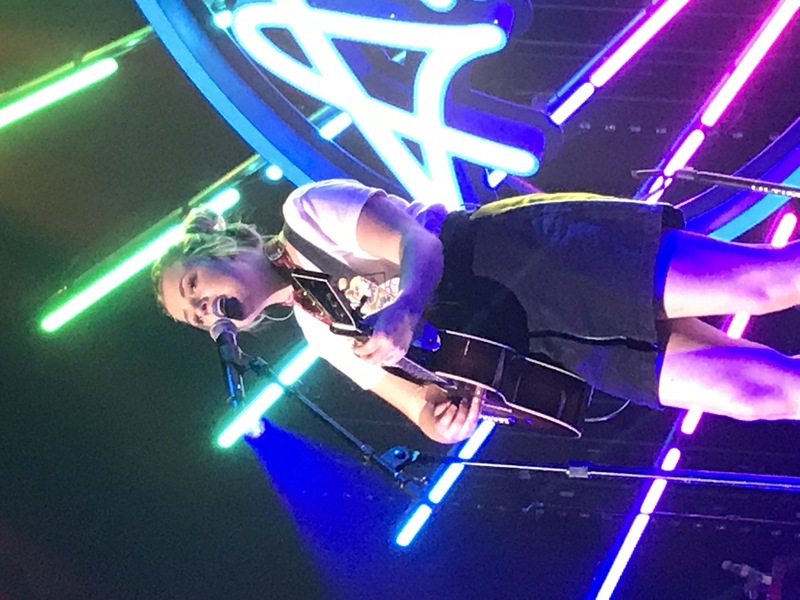 And seeing the winner of the latest season, Maddie Poppe, was truly a religious experience, as her voice is such an ethereal mix of harmonic and emotional nuances – the best that folk-pop has to offer. 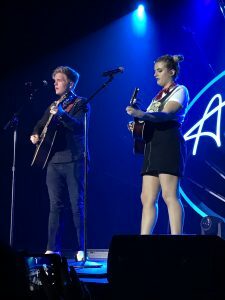 Seemingly channeling greats like Joni Mitchell and Stevie Nicks, Maddie Poppe puts on a show that is hard to forget. Kris Allen, the winner of season eight of the show, was also slated to be the opening act, but due to a family emergency, Connecticut native Nick Fradiani (and winner of season fourteen) opted to fill-in, and brought a great energy to the stage. 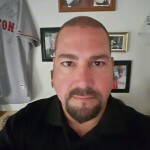 He sang his hit song from the show, “Beautiful Life”, which is a great song encouraging its listeners to live life to its fullest. The majority of the show consisted of radio-hit covers including the Bangles’ “Walk Like an Egyptian”, Camilla Cabello’s “Havana”, and even Katy Perry’s “Part of Me” was stripped down to raw vocals and harmonies by Catie and Maddie (which was nothing short of beautiful). Catie quickly rose to being a fan-favorite after her initial audition with her clever original song “21st Century Machine”, which I highly recommend looking up on YouTube if you haven’t already. 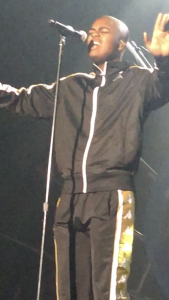 Michael also lended his very R&B-sounding vocals and quirky personality to many of the songs, which was quite fun as he’s very animated and unique. However, he can also do mellow really well, as he showed off his very nuanced vocals in Celine Dion’s “My Heart Will Go On”. Toward the middle of the set, Catie addressed the crowd: “Can I ask you something? 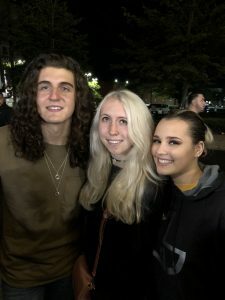 And be as honest as you’d like, tell me if it’s stupid… but how about my friends and I come out to the crowd to dance with you guys?” The crowd went wild, and all eyes were on Maddie, Catie, and Gabby as they joined the crowd while singing Andy Grammar’s hit “Good To Be Alive”. 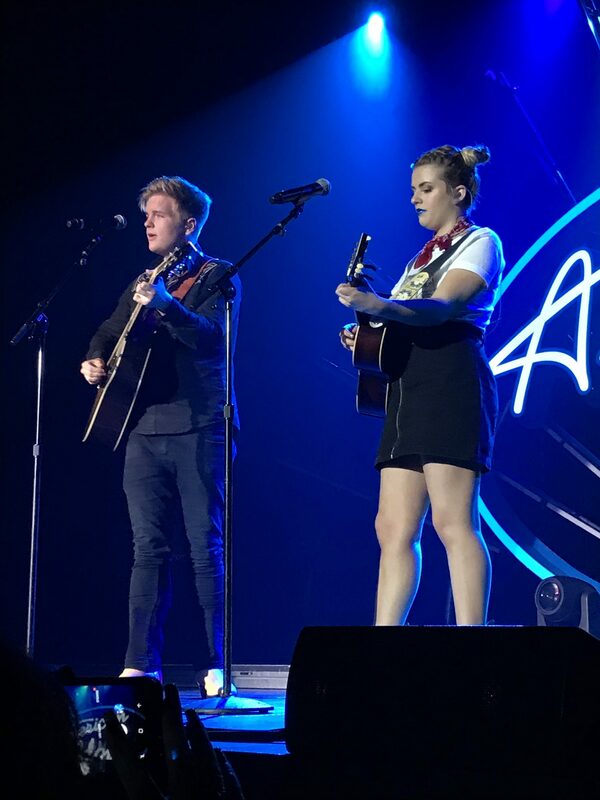 One of the stand-out moments for me was when Maddie and her boyfriend Caleb sang “You’ve Got a Friend In Me” (originally by Randy Newman but popularized from Pixar’s Toy Story franchise). Their voices blended together so harmoniously, and it was impossible to deny that these two are absolutely crazy about each other – it was the sweetest thing ever. Caleb also has this really silky-smooth, rich, chocolaty country tone to his voice that puts him in the same ballpark as the likes of Garth Brooks easily. Mixed with Maddie’s folk-pop style, these two are quite literally a match made in heaven. Some other great moments were Cade’s showcase songs in the show, as they were much more high-energy and featured his immaculate guitar skills on full-throttle. He often played lead guitar in many of the other songs, but hearing him perform songs that he picked from the show was so much fun – fans were treated to songs like “The Thrill is Gone” and “All Along the Watchtower”. 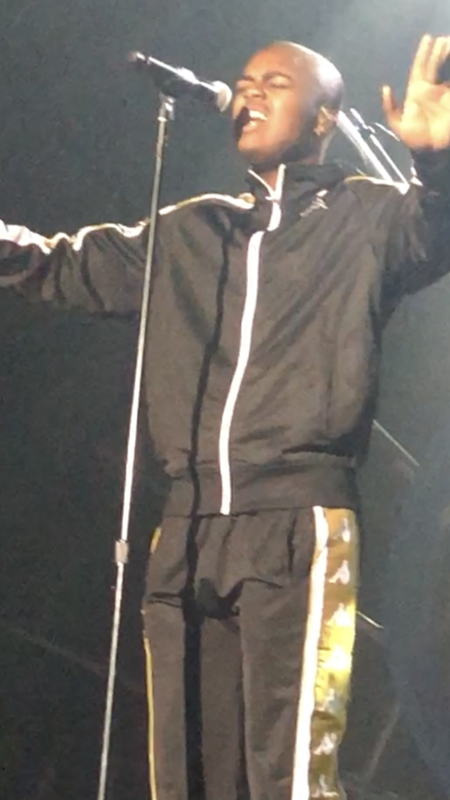 And from my second-row vantage point, I had a great view of his playing up close and personal. Being a guitarist myself, this feature of the show just really resonated with me and provided some inspiration to continue working hard at my own studies of the instrument. Another of my favorite songs that I heard at the show was Journey’s “Don’t Stop Believing” by Gabby and Cade – and specifically, watching Cade effortlessly play the guitar riffs that I myself had stumbled through. Paired with Gabby’s astronomical vocal range, these two are a power couple to keep an eye on for sure. My dad and I kept agreeing that Gabby’s voice may have stolen the show, as she consistently and powerfully hits every note with such power and accuracy, easily placing her in the ranks of the belting heart-break lyricist that is Carrie Underwood. 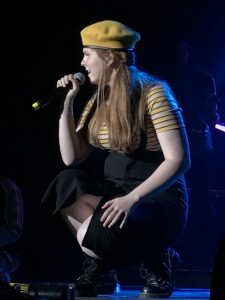 Toward the end of the set, Maddie had a bit of her own showcase (likely as the winner of the show), and she sang her debut single “Going Going Gone”, which felt like such a powerful moment showcasing both her artistry as well as her vast musical potential. That was followed-up with her sweet cover of “Rainbow Connection” which she sang with the one and only Kermit the frog on the season finale of the TV season. This was also the song that she had originally auditioned with for the show, so it undoubtedly holds a special place in her heart. She admitted on stage that “it’s a song I just never get tired of”. And as the grand finale of the show, all the finalists joined each other on stage in their energetic rendition of Shawn Mendes’ radio hit “There’s Nothing Holding Me Back”. As they bid everyone goodnight, I couldn’t stop smiling. 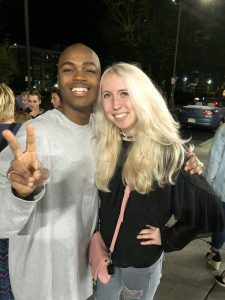 After the show, I got the opportunity to briefly chat with the contestants and take some pictures by waiting for a bit outside the venue where their buses were parked (I had heard from some other fans that the finalists routinely try to meet fans afterwards, provided venue security is okay with it). 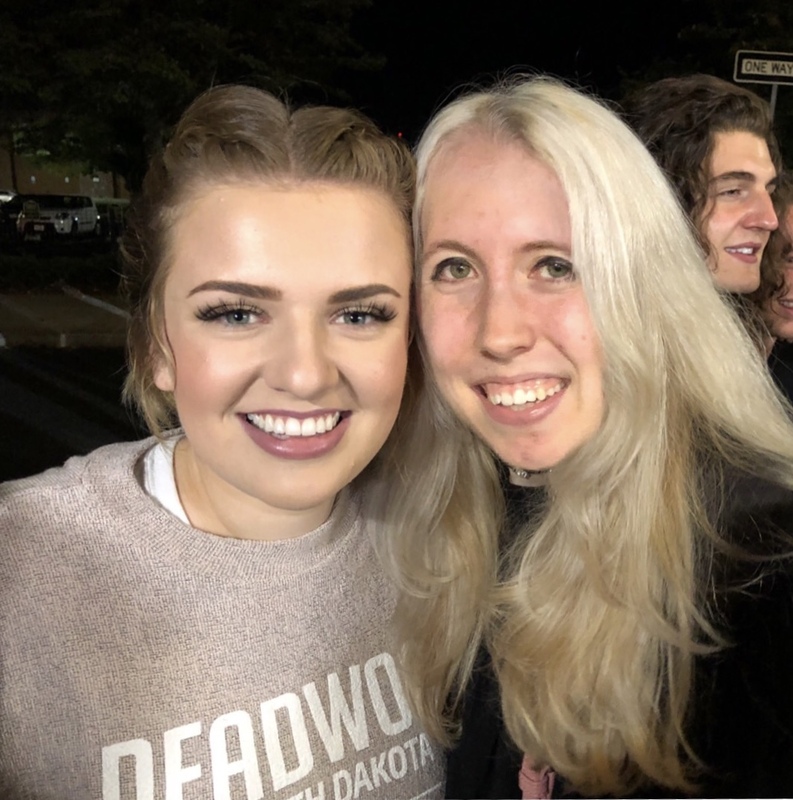 And luckily for me, I got to see Catie, Maddie, Gabby, Cade, and Michael (Caleb didn’t come out to say hello until later, so I missed him unfortunately). Catie was super sweet to me, asking me “Do you watch Game of Thrones?” I said I didn’t, but she smiled and said “Well you look just like the Mother of Dragons with your hair, it’s so pretty!” That pretty much made my day that someone as cool as Catie thought I looked like a badass character on TV, and upon Googling it later, I could sort of see what she meant. Next, Gabby and Cade made their way through the line of fans corralled behind the security gates, and I gave them both a hug and then complimented Gabby’s insane vocals and Cade’s amazing guitar playing. I told him how I too play guitar (and even “Don’t Stop Believing”), but that I’m not half as good as him and he made that quick riff look so easy! I also asked him what his advice would be for improving at guitar, and he said “Oh gee, I’m not sure. But I’d say just play along with songs that you like” which is a good laid-back approach for sure. After that, I saw Maddie, and commented on how it was so cool how she won the show, and how much I loved her “Rainbow Connection” cover. 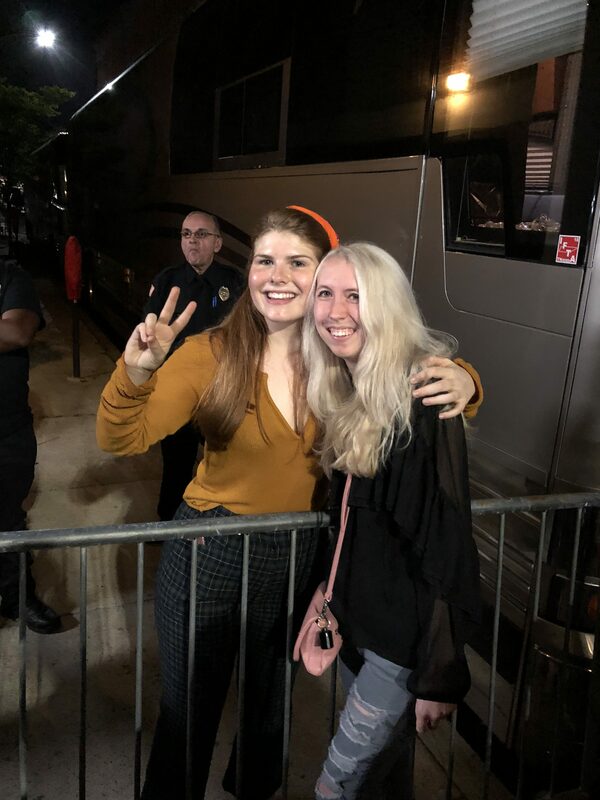 “I don’t know if you’ve heard the Hayley Williams cover or not, but yours is every bit as good!” She nodded, saying that she had seen it indeed. I also got to see Michael, who gave me a big hug and seemed so genuinely happy to meet the fans, even though he was probably exhausted for touring for months at this point. Overall, this show was the embodiment of not just this season, but my first time seeing the American Idol LIVE tour – you can best believe that I’ll be back next year to see the next crop of new talent to join the ranks of the stars. 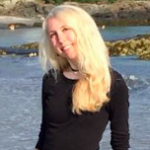 In addition to her writing career as an author through Kindle Direct Publishing, Singer is a college undergrad studying English, Music, and of course, Creative Writing. In her spare time she enjoys crocheting (with a portfolio of work available for purchase on Instagram @asinger320), as well as mentoring younger music students at a local music store, where she has been studying guitar for nearly a decade. She views her writing as a way to simultaneously escape from and embrace reality. Fabulous article! I got to see the tour at the Ryman Auditorium in Nashville. I totally agree with you about Maddie Poppe’s voice. 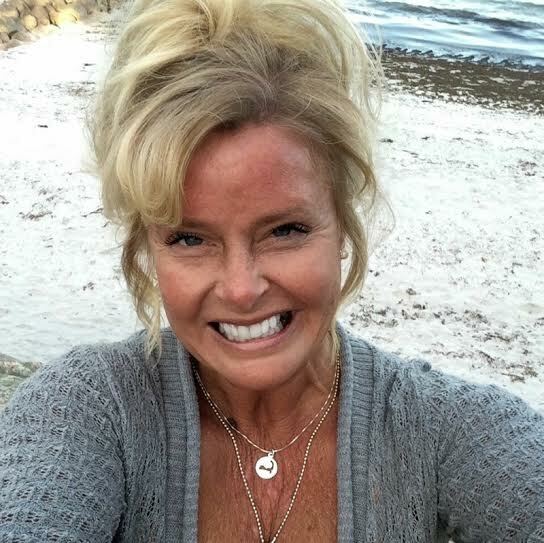 I am 57 years old and I’ve heard a lot of singers over my lifetime but there is something about her voice that is mesmerizing and you just can’t stop listening!